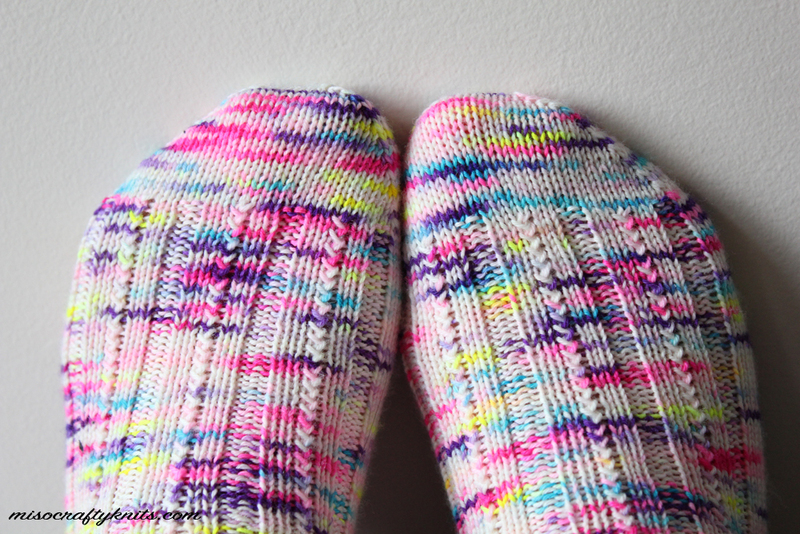 Two weeks ago I finally got around to finishing up my Sprinkled Skyp socks. Yay!! This is pair #8 for the Socks With Sarah KAL and #10 for the year. I'm pretty excited that I've managed to knit 11 pairs of socks so far this year (#11 was my Halloweenie socks) and would be completely chuffed if I can finish the year off with at least 12 pairs under my belt. I think this is a totally doable goal considering that I currently have 2 sock WIPs on the needles and there's always a lot of waiting to do before and during the holiday season (such as: waiting in line at stores, waiting in line to see Santa, waiting for Christmas concerts to start...you get the picture) AND the Mister finally remembered to take proper time off for the holidays. You just know I'm going to knit up a storm during his time off! 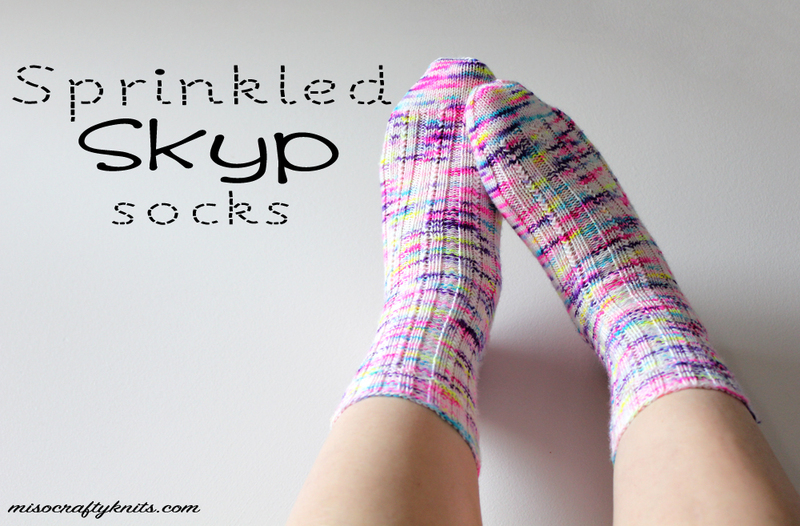 Anyhoo, back to the Sprinkled Skyp socks. These babies took a little longer to complete than I anticipated. Not because the pattern is hard or anything - far from it! - but because I had other knits on the go and obligations to attend to. I don't know if this is the same for you but socks always seem to go on the back burner or gets stuffed into a handbag for "strictly for the car" knitting whenever a bigger project grabs my attention. Lucky for me though, the Skyp pattern is a pretty easy knit and memorable to boot. The actual Skyp stitch is a two-round pattern repeat that makes it clear as to which round you've just completed and therefore makes it a no-brainer to figure out where you've left off - even if you haven't knit on the sock in weeks. I like that the socks don't look fussy (unless you knit them using a fussy yarn) and even though they're designed for men - judging by the pattern's sizing for men, that is - I think this pattern is perfectly suitable for either male or female. I can see why so many knitters have knit this pattern up more than once. I made two teeny, tiny mods and that was knitting an extra repeat on the leg and knitting the cuff until it measured 1" rather than just the 10 rounds the pattern called for, as I thought the 10 rounds looked odd and unusually short to me. While the height of the leg is just ok, I should have knit them longer. As they are now, they are about 2" shorter than my norm. But that's ok. Not every sock I knit needs to be calf height or higher. I actually have a pair of rain booties that these socks would be perfect for! Man, is it ever hard to take decent closeup shots of your own foot! Design feature? Yeah...sure! Let's go with that. I used exactly half of my skein of RainCityKnits Superwash Merino/Nylon Sock so I'm definitely putting the leftovers directly back into the stash instead of the leftovers bin. I know I can eek out another pair of socks and may already have plans of using another ball of leftovers in a hot pink for the toe/heel/cuff. There's absolutely no way I'm going to let any of this yarn go to waste! It was such a pleasure to knit with this yarn. Because of the way it was dyed, the yarn has no real "pattern" to it and I had a feeling I didn't have to worry about pooling or even flashing. This colourway was so fun to knit with because I had no idea what colour was going to pop up next or how many stitches I was going to get out of a colour. I got excited whenever I got to knit up the highlighter yellow and for some strange reason I got a lot of glee from knitting a solo stitch in one colour - it didn't matter what colour it was as long as it was enough to knit that one single stitch. I'm still up in the air about whether or not if I made the right pairing of yarn to pattern. I love both but I'm not sure if they actually mesh well together. I wonder if the yarn is too busy for the pattern and vice versa. What do you think? 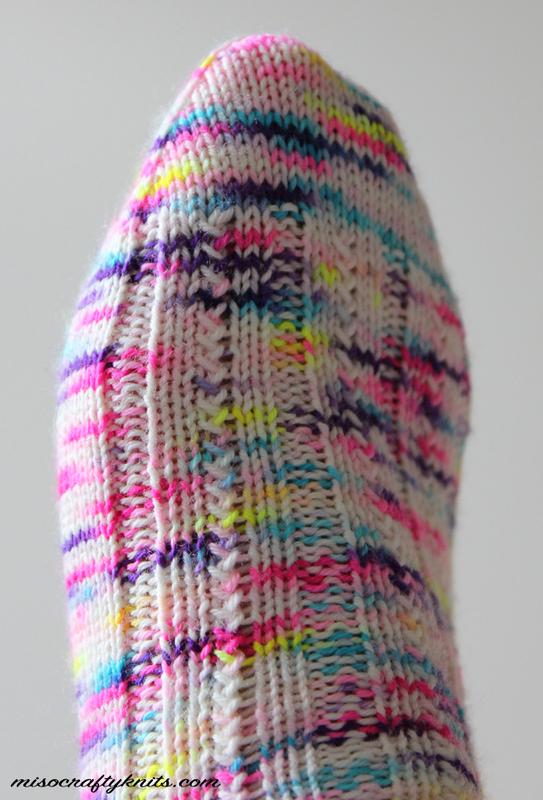 Actually -- your socks inspired me to use my speckled yarn for this pattern. I don't think it's busy at all! Nope - yarn looks spectacular with the pattern, made me actually come & have a look! I have heaps of speckled yarn, & now can add at least 1 more pattern to use them for!! Love them. Not too busy at all.